Outcropping spodumene-rich pegmatites have been assayed initially in June and will be followed up shortly with the second phase of exploration at Hidden Lake in NWT. After a healthy correction in the senior and junior lithium space over the last few months, the market appears to be gaining traction again. Today, 92 Resources Corp. announced the start of the second exploration phase on its fully owned Hidden Lake Lihtium Property, located adjacent to Highway #4 and northeast of Yellowknife in Northwest Territories (“NWT”). On the day announcing initial high-grade lithium assays from phase 1, the stock increased strongly from $0.10 to $0.27 CAD (+170%) under heavy volume (+25 million shares traded on June 7): The 5 samples returned high values of 1.64%, 2.45%, 2.69%, 2.89% and 3.06% Li2O (average: 2.54% Li2O). The large Whabouchi Deposit in Québec from Nemaska Lithium Inc. averages 1.5% Li2O (similar first grab samples averaged 2.88% Li2O), to produce lithium carbonate at projected costs of $3,771 USD/t. 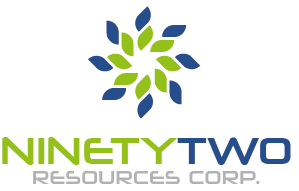 In late July, 92 Resources acquired the Pontax Property in Québec, 30 km south of the James Bay Deposit from Galaxy Resources Ltd., reported to contain indicated resources of almost 12 million tonnes averaging 1.3% Li2O at a 0.75% Li2O cut-off. Picture from the June sampling program on Hidden Lake: A geologist from 92 Resources stands on top of a large outcropping pegmatite dyke rich in lithium. The dominant lithium-bearing mineral on the Hidden Lake Property appears to be very coarse grained, light gray to light-greenish gray spodumene. The pegmatite continues both to the northeast and southwest of the sampled area in phase-2 (June 2016). Some of the spodumene-rich pegmatites in Québec’s James Bay Lithium District also have relatively coarse crystals (usually more than 5 cm, sometimes exceeding 1 m). The spodumene crystals encountered at surface on NWT’s Hidden Lake Property are also relatively large with up to 30 cm in length. Such coarse grained spodumene mineralization is likely to respond very well to conventional processing. Picture from the June sampling program on Hidden Lake: Extremely large spodumene crystals encountered at surface. With an average width of approximately 10 m, the LU #12 Dyke pegmatite has an estimated length of more than 300 m, and is still open to the north, south and depth. Alone this outcropping pegmatite could potentially be mined with an open-pit, although more work, especially drilling, is required to prove that case. To the north is a pegmatite by the name of Shorty Dyke, which has a historic resource of 3.8 million t averaging 1.24% Li2O (lithium oxide). The Whabouchi Deposit from Nemaska Lithium Inc. hosts a total of 28 million t averaging 1.57% Li2O. Hence this means for 92 Resources that only 7 pegmatites with a similar size like Shorty Dyke are necessary to have a somewhat comparable deposit like Nemaska. Furthermore, the last assays from 92 Resources have demonstrated that historic results have been exceeded (the 5 samples averaged 2.54% Li2O, whereas historic sampling reported grades mostly between 1.4% and 1.96% Li2O). On top of all that, it is remarkable and at the same time highly encouraging that Nemaska once – when it was a similar tiny explorer like 92 Resources today – reported comparable assay results averaging 2.88% Li2O from a first grab sample program at surface). The spectacular assays of 5 rock samples from surface on June 7 were grabbed solely at the historically known spodumene pegmatite LU Dyke D12 / LU #12 Dyke. According to today’s news, the new exploration program will start shortly and will not only test the LU #12 Dyke again but also numerous other pegmatites which have been identified on the property, most of which have never been sampled for lithium. The above map emonstrates impressively that at least 10 other pegmatites are located on the Hidden Lake Property in proximity to LU #12 Dyke, which could host similar high-grade spodumene. Recent forest fires on the property have exposed a series of new pegmatites, which have been discovered with aerial photopgraphy. Lithium-rich pegmatite dykes are generally lighter coloured and more resistant to weathering and as such easy to spot from the air in case these outcrop. Even before these recent forest fires, 92 Resources has localized at least 6 other pegmatites, which look similar to LU #12 Dyke (soon to be assayed for lithium for the very first time). The current Phase II program will consist of detailed mapping and systematic channel sampling of the LU Dyke D12 and other pegmatites on the property. The Hidden Lake Property is located within the central parts of the Yellowknife Pegmatite Belt, which extends from the Blaisdell Lake pegmatite series in the north about 45 km to the south near Harding Lake. The belt parallels the Prosperous Lake Granite Suite; pegmatites, related to this intrusive complex are usually discordant and predominantly north south to northeast-southwest elongate bodies. Within these zoned pegmatite fields, lithium-rich pegmatites tend to occur a similar distance from the source granite and are typically located farthest from the source granitoids. The largest pegmatite deposits often have structural controls that increase their tonnage or grade potential. Québec’s James Bay Lithium Deposit (Galaxy Resources Ltd.; $507 million AUD market capitalization) also occurs directly at surface and resource modelling indicates that the resource is amenable to open-pit mining. According to Galaxy, there is excellent potential to increase the resources through additional delineation of the pegmatite dykes along strike and at depth and potential to increase grade through infill drilling. Lithium mineralisation at James Bay is associated with spodumene-bearing pegmatite dyke swarms, which vary in width from 60-100 m. The dikes generally outcrop at surface, and form a discontinuous corridor over a strike length of 4 km. The known lithium deposits and showings in the James Bay / Eastmain area highlight Québec as an excellent place to be, whereas the LIthium District near Yellowknife in NWT shares similiarities. Despite being relatively remote, Québec’s lithium projects are close to roads and power lines, a fact that makes the potential CAPEX/OPEX viable for development, as being the case with Whabouchi. 92 Resources has acquired a second hard-rock lithium property on July 26, which is also located in Québec.